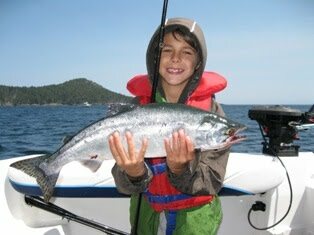 Sooke's fishing continues to be hot and cold. Some days there's a hot spot and a good bite, like Otter Point for a few evenings last week, on the flood tide. Other days, things are fairly slow all over. But one thing for sure, there are some very nice fish out there, and the only way to have a chance is to get a line in the water. 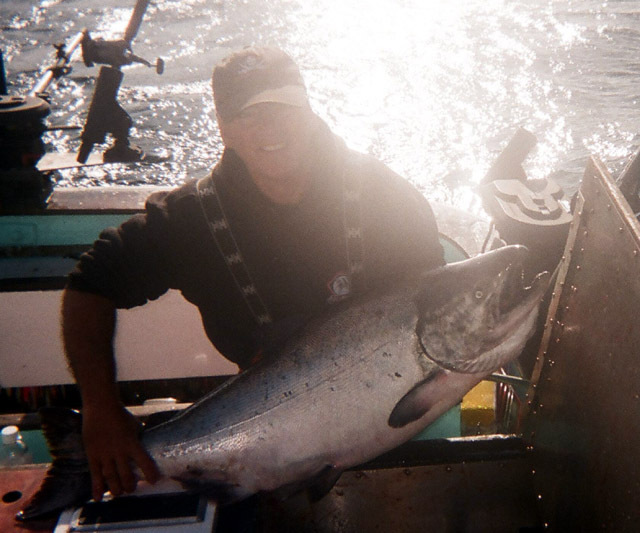 Ron from Sidetrack Fishing Charters caught a 42 pound tyee salmon off Otter Point on Sunday: "We hooked it up in the flats off of Gordons beach and third rock in 120 ft of water and 90 ft on the gear..... in the afternoon flood this past Sunday. The client who reeled it in was very good on the rod but the fish did take virtually all the line out of the reel and I did have to turn the boat around and chase it down a little. 43lbs 3oz! Its a monster looking fish! "Profisher" reports the following on sportsfishingbc: "Friday morning a bit slow but managed a 24 and lost another. Started the afternoon trip with the crowd in the hot spot for the last week but after an hour and a half only seen Cal get 2. Decided to play a hunch and make a move. From 3:40 to 5:10 we landed 28, 25, 24, 21, 14 and 10 pound springs, lost 2 more. Fish were on as fast as you could get gear in the water once the bite started. Only a single pink too! Had to be the fastest flood current I've ever seen, bite started just after peak flow and start of reduced flow." 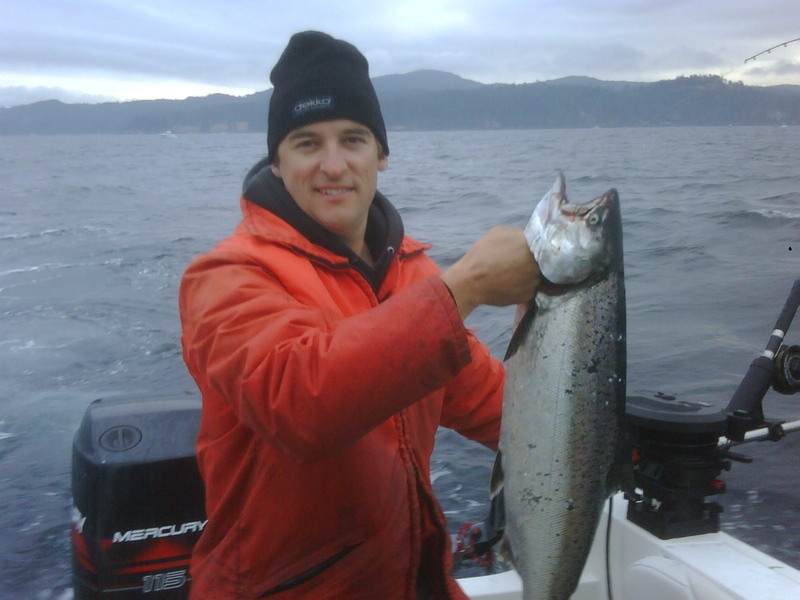 The salmon fishing for other types of salmon is very very productive and fun. 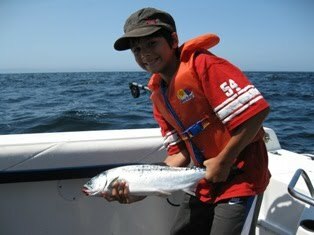 Out in the tidelines, 250' deep plus, it is non-stop action for pinks, coho, and sockeye. Right now you can only keep hatchery coho and you can't keep sockeye. Time to bring out the kids. Bring along some lighter gear, loosen the drag on your reels, and have some fun. Here Aiden and Jacob from Vancouver showing off their first ever salmon...way to go boys!